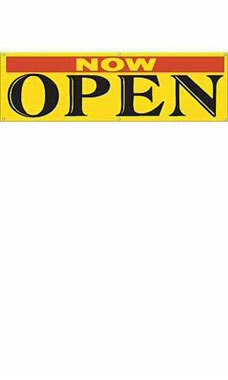 Make sure customers know you are now open and ready for business with this Now Open Banner. This 10’W x 3’H bright yellow banner is sure to attract customers as they walk or drive by. The banner features multi-color print and a durable outdoor material that is rip-resistant with double sewn hems. Banners are ready for hanging with a 6’ rope attached at each corner. Great Product! You can't go wrong with this purchase. Great ROI!! !